Anyone who goes to Alaska will swear by Denali national park. If you hear otherwise, don’t listen. The beautiful landscape of this park spans over 6 million acres and is home to Mt. Denali, North America’s tallest peak. The native term “Denali” means the “High One” for Athabascan Indians north of the Alaskan Range. Upon arrival, we made a quick stop at the Denali Visitor Center and then headed over to the Wilderness Access Center to catch our 11:00 am shuttle to ride into Denali park. In order to limit vehicles and pollution in the park, you are allowed to take your own vehicle up to mile 15 which will bring you to the Savage river entrance parking lot. Beyond this point, you can hop onto a pre-paid green shuttle bus to take you deeper in. This shuttle allows you to hop on and off at any point. To get back on the bus after a hike in the wild, you will need to wave down a bus on the main road and hope there is space to accommodate you. At the time of the year that we went to Denali (May - shoulder season), access was limited to the Toklat river which is 53 miles into the park (still pretty deep into the wilderness). If you are able to go farther to explore the park, we highly recommend that you try and make it to the end of the loop to check out Wonder Lake and Kantishna. Although we didn’t go as far as Wonder Lake, we still felt pretty satisfied with our trip as this took us a whole day and we were able to leisurely hike and explore the park. See below for some recommended points to explore beyond mile 15. We suggest that you save sites before mile 15 for a day that you are not taking the shuttle as you can do this with your own vehicle. If you are up for it, make sure to get off the bus and explore on foot. It is a little intimidating at first because you are in the wilderness, but a fantastic experience. 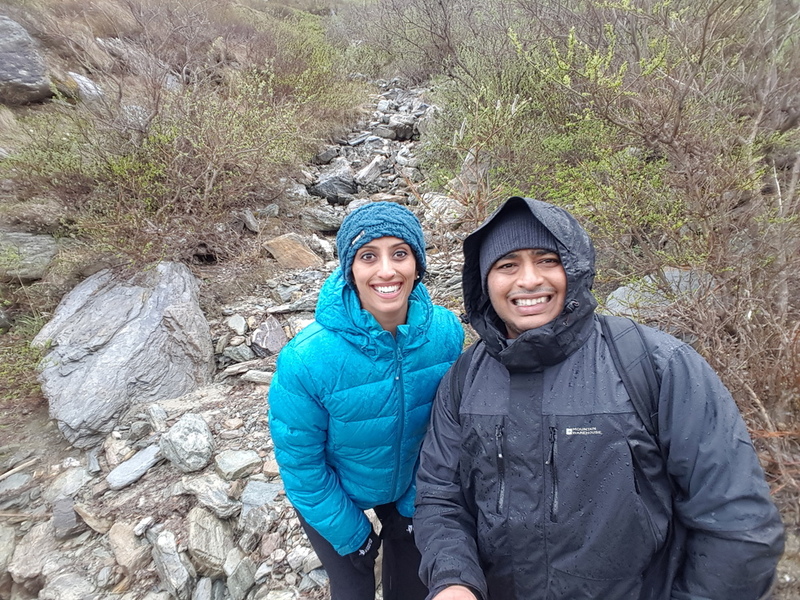 For whatever reason, we were the only two that got off the bus to hike by the Telanika river (SURPRISE SURPRISE) and boy were we glad that we did this walk. Once you climb down to the river bed, you walk right beside a beautiful fast flowing river. Word of caution…river beds also attract bears as that is where they can feed easily on salmon. Thankfully we were the only two crazies by the river that afternoon. If anyone else saw us yelling “Hey Bear” and “Ay Os” every two seconds to ward off any surprise bear visitors, they would have confirmed that we had lost our minds. But hey...you do what you have to do to keep safe. Other hikers told us that this was a must see point. However, when the shuttle got closer to this spot, the driver mentioned that this is a popular bear habitat and breeding ground. As much as we love the wilderness, we decided to pass on this one! No intention of being live feed to a threatened bear...um no thank you! While we enjoyed our ride and hike into the park, this spot stood out for it’s expansive and mind-blowing beauty. Definitely a photo spot if your camera can even do justice to the view! Coincidentally during our bus ride, we met a couple that also went to the University at Buffalo. Small world! The four of us decided to venture into the park for our next exciting hike. We spent about two hours walking along the main road and taking in all the beauty around us. We met some animal friends along our way…yay! We spoke to other hikers along our trek who shared interesting tales of the views ahead of us and any potential animal spotting. One of them warned us that there was a bear roaming close to the river bed as it was chasing down caribou or moose in the area. We walked cautiously, this time all four of us taking turns to do our crazy “Hey Bear” and “Ay O” jingle* (Bears don’t bother you if you don’t bother them apparently. We were told to make noise and stay in groups. As long as you don’t catch a bear by surprise, you should be just fine honeyJ). Just as we got back on the shuttle to make our way to Toklat river, two hikers waved down our bus to hop on board. They came running into the bus telling us about an interesting spotting ahead. Take a wild guess at what they had just seen around the road bend? Well it was a big brown grizzly!!! Our bus proceeded along cautiously and there it was. The big brown beauty! It was at that moment that I felt the very reason for my existence on this planet was satisfied (so dramatic…but hey what’s life without a little drama)! The big beauty walked across the gravel calmly and majestically. I could hear the “Bear necessities” tune playing in my head and there it was right before our eyes! What a visual treat! Having just seen a bear, we rode along to Toklat river, chatting away about the awesome creature. Once we got to the river, we heard tales about how two bears had recently taken down a moose. May be you have to be careful after all and maintain the 300 yards distance that you are told about multiple times at the park! Guess not all bears are like Balu (#Junglebook reference). We were quite exhausted by the time we got back on the shuttle to the park entrance. Just as we decided to go grab a bite, we see this beauty right on the highway. You can hear the excitement in our voices! On our second day at Denali, we decided to leisurely explore the park at our own pace. Lots of great memories from this day. Nothing much to say here…the images and video speak for themselves. This is a must stop spot. The huskies are super friendly and again we found our “Happy Place” here. Hang around to see the sled demonstration at the kennels. It is so exciting to see the whole husky pack hoot and howl as they cheer on their buddies for a run. This is a stop right before the Savage River Loop trail. So scenic and so pretty! Since we wanted a relaxing day that morning, we chose to do the 1.5 mile Savage River loop trail. A popular alternative to this is the Savage Alpine Trail which is a steeper and harder hike. I can still hear the soothing sound of the water that gushed by as we walked along staring away at the distant towering mountains. There’s nothing more delicious than home-made flavored South Indian rice after a beautiful hike. That evening, we made an impromptu decision to join a White Water Rafting tour with Denali Rafts. We layered up in our wet suits and jumped into a raft with four others to embrace the Nenana river. Our guide was super friendly and knowledgeable. He surely helped to ease our nerves as we swished past class three, class four, and even class five rapids. As we drew closer to the last one mile stretch on the river where the water was calmer, the guide suggested that we jump into the river (only if we wanted to)! I thought he was crazy, and then the next thing you know, all six raft buddies were in the freezing water, holding onto our rafts with a death grip! OMG…best experience ever!